Keeping up the FTW blogrolls has taught me a number of things. They've gone through a handful of changes over time and I thought I might share with you guys how I go about checking them each day now to stay on top of what's new. 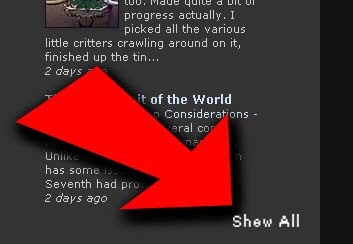 EDIT: Since this post was made, I've been able to reinstall the scrolling feature in the blog rolls to eliminate the need to do anything described in this post. Such is the life of a Blogger. "How I go about checking them" you say to yourself... like for some reason I assume you all can't figure out how to do it on your own. That's not it, I've seen the comments you guys post here, I know you're sharp and from the emails I get, nothing escapes you guys. But at the time of this posting, there are almost 700 blogs in the rolls. That's a ton of Bloggers to keep up on. No too long ago, the blogrolls had a vertical scrolling feature. I absolutely loved it. And from all the threats I received when it went away, I know some of you all did too. At a glance, I could scroll down to the last blog update I remembered seeing the day before and could catch up in an instant. The problem with the vertical scrolling feature was that with my template, the horizontal feature could not be controlled as well as I would have liked. That meant whenever someone posted and insanely long link or something similar, it affected how the blogroll looked on FTW and screwed with the formatting of the site. An unintentional result of trying to make something better. I quickly found myself spending more time trying to correct the formatting issues than I was actually looking at new posts, so something had to give. I went back to the standard format of showing the top 5 most recently updated blogs for each roll. I think it's important to have a pic and a timestamp with each update as it helps recognize previous stuff and helps give you a better idea of what the post might be about. All that being said, here's how I go through them each day. The first thing I do is scroll down to the bottom blogroll which at this point is the Fantasy roll. I take a look at the top five new ones and then click on the Show All link at the bottom of the roll. This extends the roll to show everyone and I just scroll down until I find something I recognize from the previous day. The next step is to move up to the next higher blogroll (in this case 40k Bloggers 3) and repeat the process. Look at the top five, click on Show All and cruise down until I find where I left off last. Doesn't seem like rocket science does it? But why start at the bottom you ask? If you were to start at the top blogroll, you'd have to scroll through all 250 Bloggers to get to the start of next Blogroll. By starting at the bottom blogroll first, you've only got to scroll back up though the 10 or so new posts for that particular day (if you check daily which Google Analytics tells me you all do) before you're back to where you started and can move up to the next roll. Don't believe me, give it a try and see for yourself. By starting at the bottom, you can go through all the blogrolls fairly quick now and catch up on what you might have missed. UPDATE: This post is fairly old and lots of things have changed. Sometimes it's fun to look back at where you've been. I think you'd get a lot of mileage out of a Blogroll page: something that takes the various lists out of the margin and displays them as the main content of the page. It'd make those rolls much more readable for someone who's planning to specifically work their way through the blogroll. Rushputin: That might be an idea. Unfortunately, the "Pages" option in Blogger only allows for static information to be displayed and the blogrolls are anything but that. I'm going to fiddle with some stuff and see what I can come up with. I'm confident there's some way to make it work... the question is, "But how much effort will it take?" Also, make use of Google RSS. It's like TiVo for the internet.